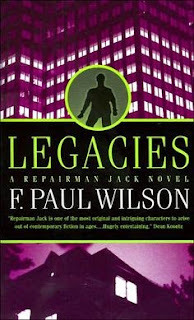 Synopsis: Repairman Jack isn’t your average appliance repairman - he fixes situations for people, often risking his own life. Jack has no last name, no social security number, works only for cash, and has no qualms when it comes to seeing that the job gets done. Dr. Alicia Clayton, a pediatrician who treats children with AIDS, is full of secrets, and she has just inherited a house that holds another. Haunted by painful memories, Alicia wants the house destroyed - but somehow everyone she enlists to help ends up violently killed. The house holds a powerful secret, and Alicia’s charmless brother Thomas seems willing to do anything to get his hands on that secret himself. (29) Review: This is the 2nd repairman Jack novel I've listened to with a different narrator. At first I wasn't sure I liked this narrator but he soon grew on me and I really started to like his interpretation of the characters. In this book Jack's humanity shines through. His girlfriend Gia introduces him to a house that helps children with AIDS and he finds his aversion to AIDS and those with it dwindling as he gets to know the children. He also meets Dr. Alicia Clayton and winds up helping her with a problem she seems to be having. With themes of drug addicted and abandoned children, children whose parents don't care or want them and those adults whose parents had once used and abused them this book had the feel of an Andrew Vachss novel. Jack becomes the savior of many and his disgust of child abuse and his love of Vicki, Gia's daughter, shine throughout the book. There is another character that plays in this book a mysterious Japanese man who is tailing some principle players in the book, his take on Jack and Jack's character were very intriguing to me as he called him a Ronin and a warrior. The definition really seems to fit Jack and I'm starting to enjoy this series more and more.